Elise has been key in the development of several northwest tribal community gardens. These gardens are places where the relationships between plants, animals and people are rekindled and remembered. While studying at the Evergreen State College Elise helped to plant the Longhouse Ethnobotanical Garden. 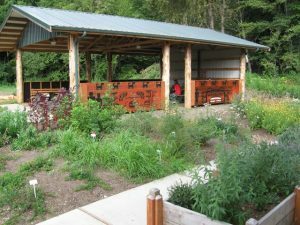 Through her experience as an herbalist, Elise assisted in the design and development of the Sayuyay Plant Garden – a partnership between the Evergreen State College and Skokomish Elder Bruce Miller. Hundreds of people have visited and helped to maintain this garden, which has inspired other gardens throughout Indian Country. One of these is the Skokomish People of the River Healing Garden. In collaboration with the Tuwaduq Family Services programs, Elise worked with staff, youth, elders, cultural specialists and other community members to design and implement this garden project. Each year summer youth mentor in the garden and community classes are offered in native foods and medicines. The garden continues to thrive. The Northwest Indian Treatment Center is a 45-day drug and alcohol residential treatment program in Elma, Washington. Elise developed the Traditional Foods and Medicines Program, which provides patients with 27 hours of training as part of their treatment program. Three on-site healing gardens offer patients the opportunity to remember their cultural wealth. Almost every tribal community in Western Washington has stories of relatives who lived to be over 100 years old. These elders are remembered for gathering their own food and engaging in a way of life that both sustained them and created a rich culture. Accessing native foods has become increasingly difficult. In the Traditional Foods of Puget Sound Project Northwest Indian College community based researches, Elise Krohn and Valerie Segrest worked with tribal elders, cooks, health-care workers, cultural specialists, archeologists and others to determine barriers to accessing native foods and to identify solutions to those barriers. As a part of this project, recipes from a 3-day tribal cook’s camp were documented. One purpose of the camp was to develop ideas for a modern diet based on traditional foods. The project findings were compiled in a book entitled Feeding the People, Feeding the Spirit: Revitalizing Northwest Coastal Indian Food Culture. Over 3,500 copies have been distributed to participating tribal communities and a curriculum based on the project is being taught through several Northwest Indian College programs. Elise contributed native food photos, an audio interview and research from the Traditional Foods of Puget Sound Project to an exhibit entitled Salish Bounty at the Burke Museum of Natural History and Culture. The exhibit is part of Hungry Planet: What the World Eats and is on display until June of 2012. Salish Bounty will then travel to tribal museums throughout Western Washington.